A Lakeside man has been sentenced to Montana State Prison for a total of 20 years with 10 years suspended for breaking into a Polson woman’s home, pouring gasoline on her and threatening to set her on fire. The incident happened on July 5, 2018. 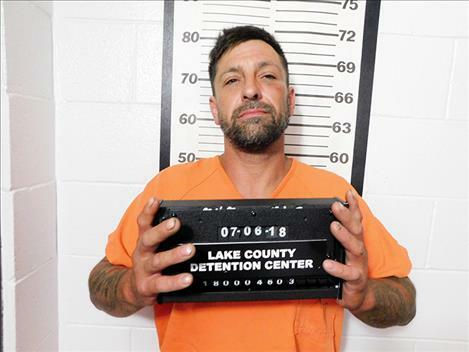 On Feb. 6, a Lake County jury convicted Dustin Hayes Knox, 42, of assault with a weapon, aggravated assault, aggravated burglary and solicitation of tampering with witnesses or informants. The jury found him not guilty on one count of robbery. District Judge James Manley sentenced Knox on April 3 to 10 years at the state prison for each of three counts to run concurrently to each other plus a consecutive 10-year sentence on the solicitation conviction. Knox was ordered to pay $1,063.34 restitution. According to court records, the victim awoke to Knox standing over her holding a lighter and demanding money. He said he would set her on fire and kill her if she didn’t comply. The woman was able to push past Knox and call out to her husband. The husband was in the living room and met Knox in the hallway where Knox allegedly threatened to kill him with a hammer in his hand. The husband and wife were able to flee their home. The husband took a photo of Knox and Knox’s vehicle with the license plate number. He was arrested a short time later by law enforcement in Flathead County and returned to Polson to face charges. At the scene of the incident, a Lake County Sheriff’s Office deputy located a water bottle containing what smelled like gasoline in the bedroom of the victim’s residence. The deputy also observed that the female victim smelled of gasoline. The woman suffered chemical burns to her face and body. A hammer matching the one described by the victim’s husband was found in Knox’s car. Lake County Deputy Attorney Ben Anciaux later added the solicitation charge when authorities intercepted a letter written by Knox to his girlfriend seeking help in getting others to stop the victim from testifying in the case. Manley called the incident “one of the most bizarre and frightening stories” he had ever heard.